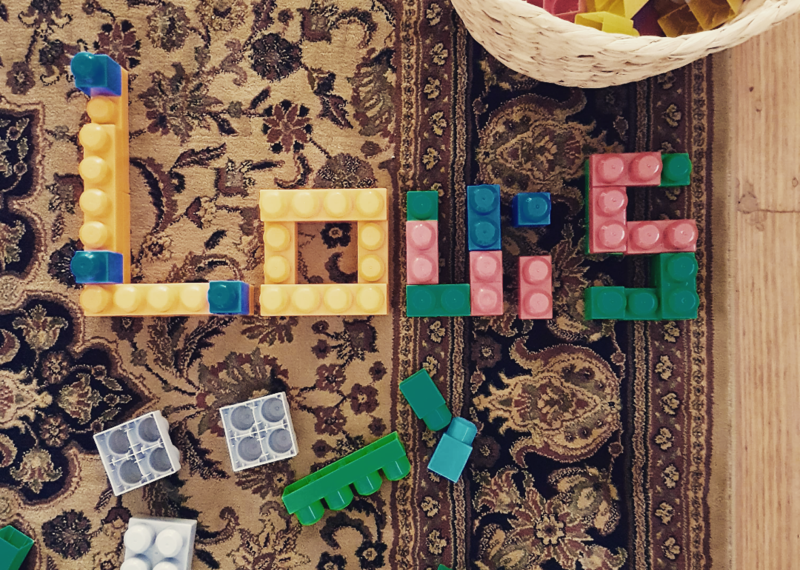 Blocks, Duplo, Lego or whatever name or shape they take, blocks really are a super toy! Blocks are a massive deal in our house. L really loves them, and so does his Papa :). It has been our most consistent tool for play. We take some blocks with us when we go away, and I make sure his Grandparents have some blocks around their place too! We all know that blocks are great for fine motor skill development, but what else are they good for? Turns out, heaps of stuff! We use them to make our names. Adding in an element of touch can really help learn new concepts. Hopefully this helps L learn his name! Fine Motor Skills- Firstly, just reiterating how playing with blocks allows children to develop and improve both their fine and gross motor skills. As they reach for, lift, move, manipulate and build with the blocks it strengthens their fingers, hands, and arms. It also assists in developing hand-eye coordination! Bonus! Problem Solving- Playing with blocks can enhance logical thinking capability – it provides mental stimulation and teaches kids cause and effect. For example, if Louie places the block too close to the edge the tower topples over. And trust me, he’s done that before. That trial and error type experience is absolutely vital for learning. Early math and Engineering skills- It has been well documented over and over again that children learn better through doing! Through touch and feel. Feeling the blocks and getting to know ever corner and edge enhances their ability to learn shapes and maths concepts like size, shape and weight (depending on the types of blocks). Building towers and watching it topple over is a great way for children to understand the best use of each block depending on their shape. And remember, shapes all have a purpose in this world. Tyres are circles, doors are rectangles, etc. So playing with blocks can help children learn about which shapes is best suited to a particular purpose. Creative Thinking- You can make all sorts of wonderful things with blocks. You can make pictures, build your name, make patterns or create a scene of a past experience. It’s just another tool to get children thinking creatively and another way for them to communicate something from their own world. Cooperative play- Need I say more? Playing with another child/ children can get pretty tricky sometimes. Particularly if they want the same toy at the same time. Blocks encourage co operative play. Children can work with a friend to something special. Co ordinating and negotiating where the blocks will go, which colours to use, how they hope it will function or move. Lots of talking and navigating through the building process is so valuable to team building skills vital for later in life. Language and Social Skills- Following on from my last point. Language skills! All the talking, negotiating and explaining really help to develop language skills. Every time your child describes their masterpiece to you they are practising their communication. They may even stumble across new words, if you guide them. Persistence- Last, and certainly not least, and my favourite. Persistence! I have seen first hand how students give up when challenged or unsure. It’s really important for LIFE to be persistent when faced with challenges or problems to solve. Building with blocks requires persistence when the tower keeps falling, or the shape doesn’t look quite right. Your child will have an inner dialogue, like we all do, and hopefully it sounds a little like this… “How can I fix this? What can I do? I am not giving up! I can do this!” The more you child is exposed to abstract and open ended play like this, the more easily they will develop persistence and resilience to solve problems during other learning tasks. Now you have seen all the benefits of playing with blocks… pull them out of the cupboard, dust them off, and invite your children to build, play, explore and create! My 2yo loves blocks and now that she is past the ‘push any tower over’ stage she currently enjoys sorting into colour groups. We haven’t built her name using the blocks like pictured. That is a great idea to try though!